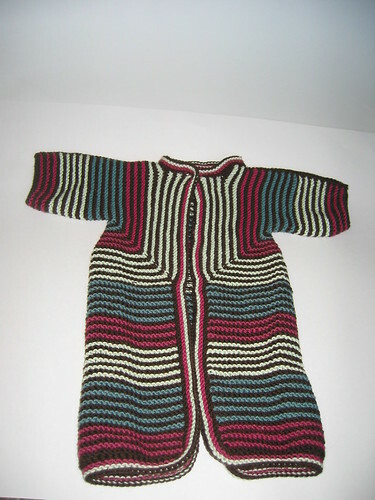 Midnightsky Fibers: UFO: Baby Surprise Jacket, Snowsuit style! UFO: Baby Surprise Jacket, Snowsuit style! Debbie Bliss baby cashmerino. Love this yarn. 137/50 gram skein, so it took several skeins, but wasn't too bad. I finished the knitting awhile ago, a coworker of mine at the yarn store had talked about how ridiculously cute this snowsuit is (Baby Surprise Snowsuit on Rav), so of course I had to cast on to make one right away! I just need to sew on snaps to finish it, which I haven't been motivated to do yet since I don't know that many people with babies, or at least babies small enough to fit in to it!